Jakarta, October 16th 2014 – Continuing the growth of Indonesia's popular budget hotel chain, Archipelago International launched the newest favehotel property on the Island of the Gods. Located on Bali's major thoroughfare, favehotel Sunset – Seminyak will be the fifth favehotel to open on the island. Uniquely designed, favehotel Sunset – Seminyak will be an upbeat value hotel with a fun atmosphere, fresh feel and friendly services. Surprisingly different to most low-cost accommodation options, the hotel is set to be a top choice for budget conscious travelers to Bali. This new “fave” will sit in fashionable Seminyak on the northern end of Sunset Road, offering the best things that Seminyak has to offer all within easy reach. Inside the hotel, guests will find high quality facilities not usually found in great value hotels, such as 100% high knot count cotton bed sheets and duvets, in-room massages, 32” LED TVs and a swimming pool. The 100-room hotel will also feature two modern conference rooms, an eclectic coffee shop and plenty of parking space, as well as complimentary, reliable and truly high speed WiFi throughout the entire hotel. Seminyak is one of the most popular areas in Bali, owing to its high density of high-end shopping and clusters of fine eating places. With so much to see and do in the area, Seminyak has rapidly become one of the most well known tourist spots on the island. “Seminyak area is a perfect match for a favehotel - an area immensely popular with young hip tourists seeking chic designs and trendy concepts without high price tags. favehotels offer just that. They provide stylish, inexpensive accommodation options with super clean and functional rooms at a reasonable price, and they never compromise on style or character.” Said Mr. Jules Brookfield – Vice President of Technology and Integration of Archipelago International. Seen In the Image : Mrs. Maria Rosaline as HM favehotel Sunset Seminyak, Mr. Wayan Suastha, Mrs. Satrio Wahyuni, Mr. Aditya Wahyu Lesmana, Mr. Rudy Nugraha Pradana as Owner and Board Director from PT. Tri Wahyu Pradana also Mrs. 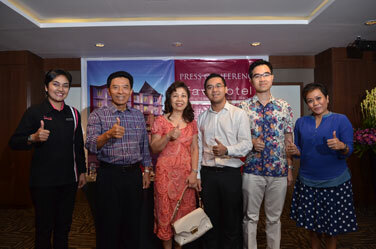 Happy Lutjika as DOSM from Archipelago International during press conference event. Seen in the Image : Mrs. Maria Rosaline as HM favehotel Sunset Seminyak, Mr. Jules Brookfield sebagai VP Technology from Archipelago International, Mr. Wayan Suastha, Ibu Satrio Wahyuni, Mr. Aditya Wahyu Lesmana, Mr. Rudy Nugraha Pradana as Owner and Board Director from PT. Tri Wahyu Pradana during rice cone cutting. 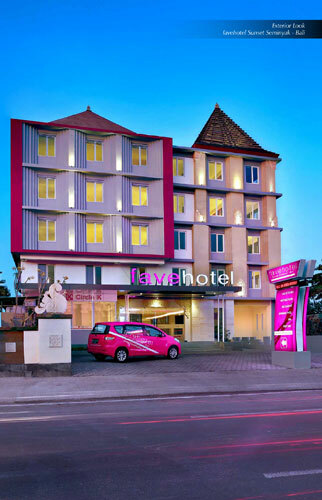 Exterior Look of favehotel Sunset Seminyak - Bali.